A fabulous parcel of goodies for my customers and some more stash for me to play with arrived this week. I had been wanting to play with the Noteworthy Die, ever since my upline Claire showed it to me. I made these super super quick little thank you cards using it. I folded the card stock in half before placing it over half the die. Stuck some leftover pieces of Designed Paper (Hostess level 1 pad), stamped a sentiment and added some faux stitching. I cupped them with the end of a pencil and inked the edges, added a pearl which seems to just finish them off nicely. 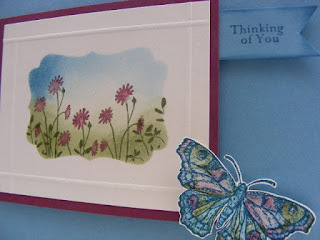 I loved the cards that Vicky from CraftingClare made here. Just had to have a go myself, here is the first card I made using this technique. Think I'll be demoing this at one of my classes soon. Hubby hadn't got her a pressie, so I decorated a little notebook in the same colours and theme. Dug out my paper crimper hadn't used in years to make the leaves, punched them out with the Blossom punch, folded them in half and put them through the crimper. Also used a white gel pen to great effect to highlight different areas. Made this short little video showing how to add a bit of interest to your cards with the humble Cropadile (available of course through me via Stampin Up). It is a tough little gadget that can cut through CDs and a few layers of card like butter - however with the two sized holes it can also be used decoratively. All the cards below were made from one piece of 12x12 card - the first is a standard a6 size, while the other are smaller. Please look at the tags below to see what I used. This was one of the cards we made at the Colour Class today. Had a lovely morning with my ladies making cards. One of the things I was determined to do when I became a Stampin Up demonstrator, was to still be true to my style and the type of cards I enjoy making. Although I have been really enjoying getting out of my comfort zone and trying new techniques and products, it was lovely to return to 3D flowers and leaves and a pretty butterfly. I'm loving the blender pen to fill in parts of the butterfly. I'll be demoing this card at my new Colour Class tomorrow and on the 23rd. This one is using 3 colours that are next to each other on the colour wheel. Gave this card to my friend today, so I can put it on here! I love making a sheet of my own "patterned paper" and then using it in different ways to create different cards. 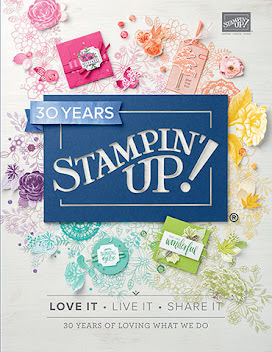 I fell in love with this stamp set the moment I saw it in the catalogue, and when I booked my party with Claire (now my upline) I knew I was going to order it. 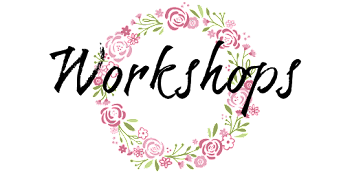 It's so shabby chic, Kath Kidston style, classic, pretty and girly. 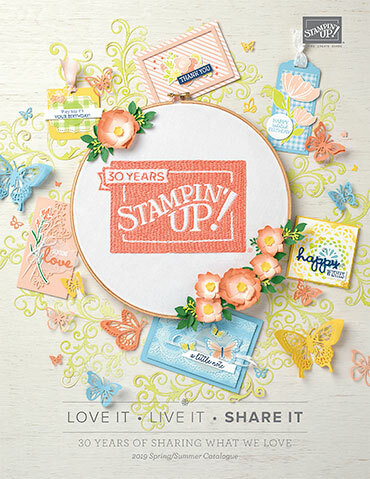 Used a piece of Designer Paper from the pack you could earn as a hostess and a stamp from a set from the level 2 Hostess section as well as the Baby Blossom stamps. Please see the labels below for the different colours and stamps sets used. I love creating beautiful backgrounds with these floral stamps. Just had delivery of my first ever order as a demo. The stamps etc. are all bagged up ready to go to their new homes to be played with! I bought myself the set of Regals ink pads. I must say I am impressed with the quality, and that combined with the Very Vanilla cardstock which is so smooth and seems to just take the ink so well - I am very please with the results. I've been thinking and talking to people about the sort of things they would like to learn in a class. I've had one lady say it's nice to know how to cut and stick things, but she would like to know what to do with things to create a card. I've tried to break the elements down into different classes. I've already covered some basic stamping techniques in earlier classes - which I am happy to do for anyone who is new to stamping. Then I thought that colour and how to use it would be another good area to cover, and later on a class on placement and balance. There are lots of ideas going on in my head!!! There are two dates and times available. Please contact me to book a place asap as spaces are limited, thank you.